Packers tickets are heading out the door, and into the hands of fans that placed their orders early. The 2013 schedule includes some pretty tough opponents, not including the divisional games that are always a challenge. 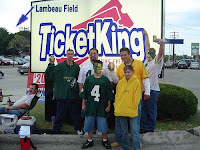 Which Green Bay Packers game are you going to? The regular season is just a few weeks away. Green Bay will then head to Cincinnati to take on the Bengals on 9/22. They head back to Lambeau for a game against the Lions on October 6, just after the bye week. Packers fans will get the chance to see the team take on the 2013 Super Bowl champion Baltimore Ravens on October 13. Ray Lewis may have retired, but that doesn’t mean the Ravens will be pushovers. As for the rest of the 2013 Packers Schedule, here it is in all its glory. Ticket King has tickets for all Packers home and road games. Go Packers!